A fully-equiped river program requires a lot of "stuff." It can be difficult for schools to purchase all these items. You may be just starting a program and not know where to begin. Friends of the Chicago River has a large variety of water quality equipment and reference materials to loan. Let us help you. What types of equipment and materials are available? 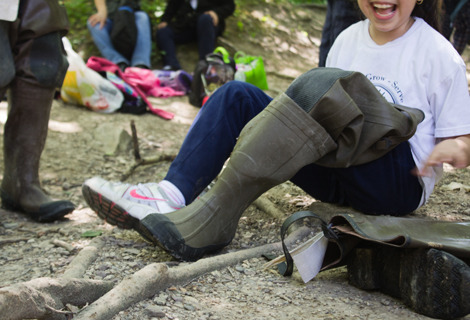 For schools in our Chicago River Schools Network, we can loan beginner and advanced water chemistry test kits, turbidity tubes, TDS probes, nets, hip waders, macroinvertebrate identification sheets, trays, forceps, tape measures, compasses, stopwatches, and field guides, just for starters. Each classroom lesson and/or field trip activity has a list of equipment necessary to teach it listed on the write-up. Friends can help by providing most of these items. If you wish to borrow any materials to teach in your classroom or for use in the field, please complete an EQUIPMENT LOAN FORM and return it to our education staff. Let us know how long you wish to borrow the equipment, as it may be needed for another school's field trip. Friends also has a selection of reference books, picture books, field guides, videos and CD-ROMs available for loan. These are available to any school within the Chicago River watershed. Friends will bring any needed equipment with us on a field trip - as long as it’s available. When you schedule a field trip, be sure to let us know what equipment you will need when you complete your Field Trip Needs Form found in the field trip logistics information. You may also wish to purchase your own equipment and supplies, especially if your school participates in a large number of field trips. If you don’t see an item listed on the form listed below, please contact us for a recommendation about where to buy it. A guide to cleaning and maintaining equipment, where to purchase items, and (in some cases) how to make your own.